Forging a partnership with Anaheim High School has been a dream of ours at City Church for many years. Seeing it come to fruition over the course of the last year or so has been nothing short of amazing. In a very short period of time, we have already done a lot together. One of the most significant accomplishments is the completion of a joint art mural project on the Citron side of our campus. The piece was entirely put together by the art club from the 2017-2018 school year and a woman from our church. 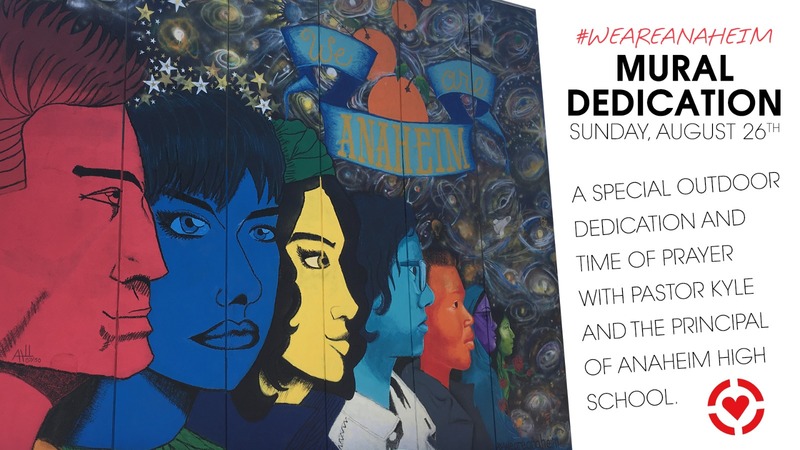 Join us this Sunday as we dedicate this mural and honor the young men and women who worked hard to make it happen. Anaheim High School’s principal Roberto Saldivar will share a few words at each service. City Church will recognize and thank those who worked on the project. We will have a brief time of prayer for educators, school administration, and students alike joining a new school year. In between services at (10:40/45am), we will have a brief outdoor “ribbon cutting” in front of the mural. We expect a lot of people this weekend. Help us out by parking offsite either on the streets nearby or across the street at the Anaheim Public Library. Here’s a quick map for you to see how close the library really is. Last thing before you go, here’s a quick video invite you can share with your friends and family who might want to attend! Let the Thursday Night Church trial begin! Try dropping your kids off at City Kids when you come. It's available for kids ages 6 months to 12 years old. It's the best opportunity for them to learn about Christ in an age-appropriate manner. WANNA GROW IN YOUR FAITH? God designed us to grow in community. Take the next step in your spiritual development by getting involved in a small group or serving on a ministry team.